Inbound Marketing is a new marketing approach that involves content marketing, search engine optimization, social-media marketing, and lead nurturing strategies. The term ‘inbound marketing’ was coined in 2005 to name a whole new branch of marketing techniques that concentrate on building long-lasting relationships with customers using content marketing and lead nurturing strategies. Traditional (outbound) marketing becomes less and less effective for the two main reasons. First of all, it is intrusive and leads to customer’s annoyance with your company. Secondly, people will never use services or products of a company if someone among their acquaintances had bad experience with it. Now the latter observation came to a bigger scale, as social media, blogs, and search engines can provide high-powered impression. 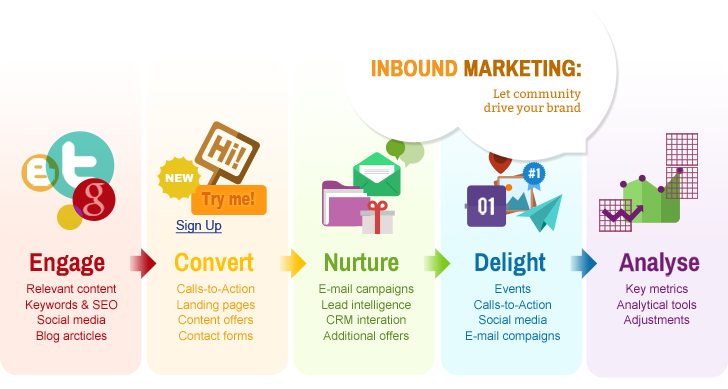 In order to make this impression positive and lasting, Inbound Marketing is used. All visitors are potential buyers, you just need to involve them into your sales funnel by creating awareness via structured content path that leads to natural interest and purchase. But purchase is not the end goal. Inbound Marketing is about continuous communication with both potential and present customers, about keeping them interested and wanting more. People want to understand what they are paying for and is it worth paying at all. Internet as an inexhaustible source of information is now the first place where they will look. Search engines, home pages, blogs, social networks - they all influence people’s choices. Create useful and compelling content, show that you possess expertise and knowledge in a certain sphere, advise and answer the “painful” questions. Consult search engine optimization tools, get to know what people are interested in, what key words and phrases they are using. Analyze and use this information while providing them with solution. Make sure your content is visible to search engines and easily shareable via social media platforms. Presence on Facebook. Twitter, LinkedIn, etc. is essential to the development of your business. Make your visitors pay for your content with the same currency - information. Everytime they want to access whitepapers, tutorials, ebooks, video content - ask them for contact information - even simple email address can become an asset in right hands. After giving you some information visitors become leads. Nurture them, store them in database and provide them with strategically placed and timed targeted emails in order to build trust. Understand your visitor, check what content did he/she download, what services or products is he/she interested in, what pages did they visit, are they following you in social networks. Only after collecting and carefully analyzing this information you can send lead nurturing emails and newsletters. Remember, the more content types and channels you use - the bigger number of people would get involved. It is not possible or advised to use all of available internet resources, but it is crucial to determine the most influential ones. The actual challenge is to analyze visitors’ behavior and detect patterns that will lead to successful interaction. Track feedback of each action, use all available tools and software that will show what marketing efforts work and what can be improved. Never exclude existing customers from your marketing endeavor. Engage them with your initiatives. They still can buy your products. What is even more important, they can become free promoters of your company. What is more attractive advertisement than satisfied customers? Complex inbound marketing techniques include content marketing, search engine optimization, social-media marketing, and lead nurturing strategies. They target potential customers and convert them into leads and successful sales with more success and less cost than traditional outbound marketing. Moreover, they ensure positive image and lasting reputation that is the best investment into your business future. Apply Inbound Marketing and customers will find you themselves. Use simple recipe - create compelling and helpful content, pay attention to SEO, be active in social media platforms, analyze, understand trends and build trust with the visitors as they can become your clients. Applying Inbound Marketing demands time and proficiency. If you are not ready to dedicate your time and resources to keep up with all new tendencies in this perspective direction, transfer this task to the professionals. Quintagroup will help to introduce Inbound Marketing techniques to your business strategy.